This study explores function and regulation of protein phosphatase 2A in human skeletal muscle in obesity and type 2 diabetes. This study explores how exercise improves insulin sensitivity through novel tyrosine phosphorylation events in human skeletal muscle. This study explores protein-protein interactions of IRS-1 and phosphorylation of specific proteins in the PI-3 kinase insulin signaling pathway in human skeletal muscle in obesity and type 2 diabetes. Administrative Supplements to R01 DK081750-01A1. This research assesses global changes in protein phosphorylation under both basal and insulin stimulated conditions in insulin resistant muscle. •	02/2015, 10/2016, Temporary study section member, NIH/NIDDK, CIDO. I have developed and maintained a vigorous independent research program (currently funded by two R01 awards by NIDDK) in the area of insulin signaling, insulin resistance, diabetes, and proteomics. Insulin resistance lies at the base of the array of diseases or pre-disease conditions such as obesity, dyslipidemia, hypertension, cardiovascular disease, type 2 diabetes, and some cancers. However, the molecular mechanisms of its pathogenesis remain elusive. Insulin regulates a wide variety of biological processes, and defects in insulin signaling in skeletal muscle are considered to be among the main causes for insulin resistance and Type 2 diabetes (T2D). T2D has become a world and US epidemic. More than 10% US adults (26 million) currently have T2D, and projections indicate that the US diabetes prevalence may increase to ~30% in 2050 (www.CDC.gov). Intracellular actions of insulin are mediated by modifications of regulatory proteins and enzymes through protein-protein interactions as well as protein phosphorylation and dephosphorylation. Our research focuses on the role of novel protein-protein interactions and phosphorylation in insulin signaling in the development of skeletal muscle insulin resistance and type 2 diabetes, utilizing a combination of human clinical studies (directly measure human physiology/pathophysiology), in vitro cell studies (for detailed mechanistic studies), and cutting-edge proteomics (for global analysis of cell signaling & for unbiased discovery). Proteomics offers the capability to simultaneously quantify multiple proteins, protein-protein interactions, and protein phosphorylation, providing a better picture of complex protein networks. A State-of-the-art UPLC-nSI-MS/MS systems (Obitrap Fusion Lumos) is installed in my laboratory in 2016 in addition to the Orbitrap Elite installed in 2011. The Orbitrap Fusion Lumos is one of the most sensitive mass spectrometry instruments with high mass resolution and high mass accuracy currently available in the market. *: Positions of the trainees in Dr. Yi group are in parenthesis. GRA: graduate research assistant, and Postdoc: Postdoc-fellow. 1. Hainan Li, Megan O'Meara, Xiang Zhang, Kezhong Zhang, Berhane Seyoum, Zhengping Yi, Randall Kaufman, Terrence Monks, and Jiemei Wang, "Ameliorating methylglyoxal-induced progenitor cell dysfunction for tissue repair in diabetes", Diabetes, 2019, accepted. 2. Kyle J. Burghardt, Kristen M. Ward, Elani J. Sanders, Bradley H. Howlett, Berhane Seyoum, and Zhengping Yi, "Atypical Antipsychotics and the Human Skeletal Muscle Lipidome", Metabolites, 2018, 8(4), 64; DOI: 10.3390/metabo8040064, PMID: 30322152. 3. Kyle J. Burghardt, Berhane Seyoum, Abdullah Mallisho, Elani Sanders, Zhengping Yi, "Protein Kinase B (AKT) DNA Hypermethylation with Maintenance Atypical Antipsychotic Treatment in Participants with Bipolar Disorder", Pharmacotherapy, 2018 Feb 27. doi: 10.1002/phar.2097. [Epub ahead of print]. PMID: 29484683. 4. Kyle J. Burghardt, Berhane Seyoum, Abdullah Mallisho, Paul Burghardt, Reno Kowluru, Zhengping Yi, "Atypical antipsychotics, insulin resistance and weight; a meta-analysis of healthy volunteer studies", Progress in Neuro-Psychopharmacology and Biological Psychiatry, 2018 Apr 20;83:55-63. doi: 10.1016/j.pnpbp.2018.01.004. Epub 2018 Jan 8. PMID: 29325867. 5. Xitao Xie, Sandeep Sinha, Zhengping Yi, Paul Langlais, Meenu Madan, Benjamin Bowen, Wayne Willis, and Christian Meyer, "Role of Adipocyte Mitochondria in Inflammation, Lipemia and Insulin Sensitivity in Humans: Effects of Pioglitazone Treatment", International Journal of Obesity, 2017, 1-8, doi: 10.1038/ijo.2017.192. PMID: 29087390. PMCID: PMC6021211. 6. Otto Muzik, Paul Burghardt; Zhengping Yi; Ajay Kumar; Berhane Seyoum, "Successful metformin treatment of insulin resistance is associated with down-regulation of the kynurenine pathway", Biochemical and Biophysical Research Communications, 2017 Jun 17;488(1):29-32. doi: 10.1016/j.bbrc.2017.04.155. 7. Kai Wu, Lingzhi Li, Chitra Thakur, Yongju Lu, Xiangmin Zhang, Zhengping Yi & Fei Chen, "Proteomic Characterization of the World Trade Center dust-activated mdig and c-myc signaling circuit linked to multiple myeloma", Scientific Reports, 2016, Nov 11;6;36305. Doi: 10.1038/srep36305. 8. Xitao Xie, Zhengping Yi, Sandeep Sinha, Meenu Madan, Benjamin P. Bowen, Paul Langlais, Danjun Ma (Postdoc), Lawrence Mandarino, and Christian Meyer, "Proteomics Analyses of Subcutaneous Adipocytes Reveal Novel Abnormalities in Human Insulin Resistance". Obesity (Silver Spring). 2016 Jul;24 (7):1506-14. doi: 10.1002/oby.21528. PMID: 27345962. 9. Xiangmin Zhang, Divyasri Damacharla (GRA), Danjun Ma (Postdoc), Yue Qi (GRA), Rebecca Tagett (GRA), Sorin Draghici, Anjaneyulu Kowluru, and Zhengping Yi, "Quantitative proteomics reveals novel protein interaction partners of PP2A catalytic subunit in pancreatic beta-cells”, Molecular and Cellular Endocrinology, 2016, 424, 1-11. PMID: 26780722. 10. Michael Caruso (Postdoc), Xiangmin Zhang, Danjun Ma (Postdoc), Zhao Yang (GRA), Yue Qi (GRA), and Zhengping Yi, “Novel Endogenous, Insulin-Stimulated Akt2 Protein Interaction Partners in L6 Myoblasts", PLosOne, 2015 Oct 14;10(10): e0140255. doi: 10.1371/journal.pone.0140255. eCollection 2015. PMID: 26465754. 11. Chengjian Tu, Quanhu Sheng, Jun Li, Danjun Ma (Postdoc), Xiaomeng Shen, Xue Wang, Yu Shyr, Zhengping Yi, and Jun Qu, "Optimization of Search Engines and Postprocessing Approaches to Maximize Peptide and Protein Identification for High-Resolution Mass Data", Journal of Proteome Research, 2015 Nov 6;14(11):4662-73. doi: 10.1021/acs.jproteome.5b00536. Epub 2015 Sep 30. PMID: 26390080. 12. 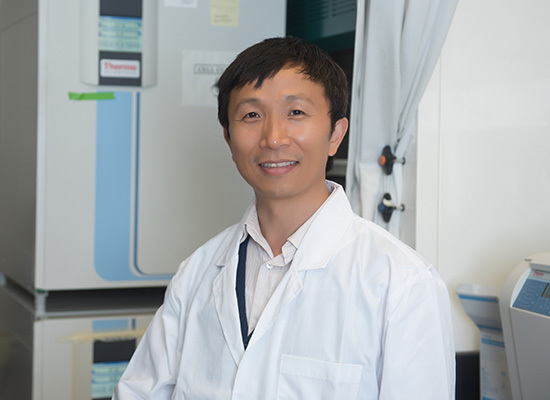 Wei Wang, Yongju Lu, Paul M. Stemmer, Xiangmin Zhang, Yongyi Bi, Zhengping Yi, Fei Chen, "The proteomic investigation reveals interaction of mdig protein with the machinery of DNA double-strand break repair", Oncotarget, 2015 Sep 29;6(29):28269-81. doi: 10.18632/oncotarget.4961 Epub July 22, 2015. 13. Feven Berhane, Alemu Fite, Nour Daboul, Wissam Al-Janabi, Zaher Msallaty (Postdoc), Michael Caruso (Postdoc), Monique K. Lewis (Postdoc), Zhengping Yi, Michael P. Diamond, Abdul-Badi Aboul-Samra, and Berhane Seyoum, "Plasma lactate levels increase during hyperinsulinemic euglycemic clamp and oral glucose tolerance test", Journal of Diabetes Research, 2015, 2015;2015:102054. doi: 10.1155/2015/102054. Epub 2015 Apr 19. PMID: 25961050. 14. Michael Caruso (Postdoc), Danjun Ma (Postdoc), Zaher Msallaty (Postdoc), Monique K. Lewis (Postdoc), Berhane Seyoum, Wissam Al-janabi, Michael Diamond, Abdul B. Abou-Samra, Kurt Hojlund, Rebecca Tagett (GRA), Sorin Draghici, Xiangmin Zhang, Jeffrey F. Horowitz, and Zhengping Yi, “Increased Interaction with Insulin Receptor Substrate-1, a Novel Abnormality in Insulin Resistance and Type 2 Diabetes”, Diabetes, 2014, Jun., 63, 1933-1947, Epub 2014 Feb. PMID: 24584551. 15. Xiangmin Zhang, Danjun Ma (Postdoc), Michael Caruso (Postdoc), Monique K. Lewis (Postdoc), Yue Qi (GRA), and Zhengping Yi, “Quantitative Phosphoproteomics Reveals Novel Phosphorylation Events in Insulin Signaling Regulated by Protein Phosphatase 1 Regulatory Subunit 12A”, Journal of Proteomics, 2014, 109, 23 September, 63–75. Epub 2014 Jun 24. PMID: 24972320. 16. Bailing Chen, Miaomiao Yu, Qingshan Chang, Yongju Lu, Chitra Thakur, Danjun Ma (Postdoc), Zhengping Yi, and Fei Chen, "Mdig de-represses H19 large intergenic non-coding RNA (lincRNA) by down-regulating H3K9me3 and heterochromatin”, Oncotarget, 2013 Sep;4(9):1427-37. Aug 10. [Epub ahead of print]. PMID: 23965803. 17. Mohammad A Qasim, Lixia Wang, Sabiha Qasim, Stephen Lu, Wuyuan Lu, Michael Ranjbar, Richard Wynn, Zhengping Yi, and Michael Laskowski Jr, “Additivity-based design of the strongest possible turkey ovomucoid third domain inhibitors for porcine pancreatic elastase (PPE) and Streptomyces griseus protease B (SGPB)”, FEBS Letters, 2013 Sep 17;587(18):3021-6. Epub 2013 Jul 23. PMID: 23892073. 18. Sophie E. Hussey, Carrie G. Sharoff, Andrew Garnham, Zhengping Yi, Benjamin Bowen, Lawrence J. Mandarino and Mark Hargreaves, "Effect of Exercise on the Skeletal Muscle Proteome in Patients with Type 2 Diabetes", Medicine and Science in Sports and Exercise, 2013 Jun;45(6):1069-76. Epub 2012 Dec 27. PMID: 23274603. 19. Xiao‐Wei Chen, He Wang, Kanika Bajaj, Pengcheng Zhang, Zhouxian Meng, Danjun Ma (Postdoc), Yongsheng Bai, Elizabeth Adams, Andrea Baines, Genggeng Yu, Maureen A. Sartor, Bin Zhang, Zhengping Yi, Jiandie Lin, Stephen G. Young, Randy Schekman, and David Ginsburg, "SEC24A Deficiency Lowers Plasma Cholesterol through Reduced PCSK9 Secretion", eLife, 2013 Apr 9;2:e00444. 20. Kimberly Pham, Paul Langlais, Xiangmin Zhang, Alex Chao, Morgan Zingsheim and Zhengping Yi, “Insulin-stimulated Phosphorylation of Protein Phosphatase 1 Regulatory Subunit 12B Revealed by HPLC-ESI-MS/MS”, Proteome Science, 2012 Sep 1;10(1):52. Epub 2012, Sept 1. 21. Thangiah Geetha, Paul Langlais, Michael Caruso (Postdoc), and Zhengping Yi, “Protein Phosphatase 1 Regulatory Subunit 12A and Catalytic Subunit, new members in the phosphatidylinositide 3-kinase Insulin Signaling Pathway”, Journal of Endocrinology, 2012 Sep; 214(3):437-43. Epub 2012 Jun 22. PMID: 22728334. 22. Xiangmin Zhang, Kurt Højlund, Moulun Luo, Christian Meyer, Geetha Thangiah, and Zhengping Yi, “Novel Tyrosine Phosphorylation Sites in Rat Skeletal Muscle Revealed by Phosphopeptide Enrichment and HPLC-ESI-MS/MS”, Journal of Proteomics, 2012 Jul 16;75(13):4017-26. Epub 2012 May 18. PMID: 22609512. 23. Alex Chao; Xiangmin Zhang; Danjun Ma (Postdoc); Paul Langlais; Moulun Luo, Lawrence J. Mandarino, Morgan Zingsheim; Kimberly Pham; James Dillon, Zhengping Yi, “Site-Specific Phosphorylation of Protein Phosphatase 1 Regulatory Subunit 12A Stimulated or Suppressed by Insulin”, Journal of Proteomics, Jun 18;75(11):3342-50. Epub 2012, April 6. PMID: 22516431. 24. Sarah Everman, Zhengping Yi, Paul Langlais, Lawrence J. Mandarino, Moulun Luo, Christine Roberts, and Christos S. Katsanos, "Measurement of Stable-Isotope Enrichment of in Vivo Labeled Muscle ATP Synthase Beta Subunit Using HPLC-ESI-MS/MS", PLoS One. 2011; 6(10):e26171. Epub 2011 Oct 12. PMID: 22022551. 25. Paul Langlais, Zhengping Yi, Jean Finlayson, Moulun Luo, Rebekka Mapes Holmes, Elena A. De Filippis, Christian Meyer, E. Plummer, P. Tongchinsub, Mark Mattern, Lawrence J. Mandarino, “Global IRS-1 phosphorylation analysis in insulin resistance”, Diabetologia, 2011 Nov;54(11):2878-89. Epub 2011, Aug 18. PMID: 21850561. 26. Rebekka Mapes Holmes, Zhengping Yi, Elena A. De Filippis, Rachele Berria, Sadeka Shahani, Padma Sathyanarayana, Vadim Sherman, Kentaro Fujiwara, Christian Meyer, Christine Christ-Roberts, Hyonson Hwang, Jean Finlayson, Lilly. Q. Dong, Lawrence J. Mandarino, and Mandeep Bajaj, "Increased abundance of the adaptor protein containing pleckstrin homology domain, phosphotyrosine binding domain and leucine zipper motif (APPL1) in patients with obesity and type 2 diabetes: evidence for altered adiponectin signalling", Diabetologia, 2011 Aug; 54(8):2122-31. Epub 2011 May 12. PMID: 21562756. 27. Paul Langlais, Zhengping Yi, Lawrence J. Mandarino, “The Identification of Raptor as a Substrate for P44/42 MARK”, Endocrinology, 2011 Apr; 152(4):1264-73. Epub 2011 Feb 15. PMID: 21325048. 28. Thangiah Geetha, Paul Langlais, Moulun Luo, Rebekka Mapes, Natalie Lefort, Shu-Chuan Chen, Lawrence J. Mandarino1 and Zhengping Yi, "Label-free Proteomic Identification of Endogenous, Insulin-stimulated Interaction Partners of Insulin Receptor Substrate-1", Journal of the American Society for Mass Spectrometry, 2011 Mar;22(3):457-66. Epub 2011 Jan 29. PMID: 21472564. 29. Lopes LB, Brophy CM, Flynn CR, Zhengping Yi, Bowen BP, Smoke C, Seal B, Panitch A, Komalavilas P., “A novel cell permeant peptide inhibitor of MAPKAP kinase II inhibits intimal hyperplasia in a human saphenous vein organ culture model”, Journal of Vascular Surgery. 2010 Dec; 52(6):1596-607. Epub 2010 Sep 22. 30. Natalie Lefort, Benjamin P. Bowen, Brian Glancy, Elena A. De Filippis, Rebekka Mapes, Hyonson Hwang, Charles R. Flynn, Wayne T. Willis, Anthony Civitarese, Kurt Hojlund, Zhengping Yi, and Lawrence J. Mandarino, “Increased ROS production and lower abundance of complex I subunits and carnitine palmitoyltransferase 1B protein despite normal mitochondrial respiration in insulin resistant human skeletal muscle”, Diabetes, 2010 Oct; 59(10):2444-52. Epub 2010 Aug 3. 31. Xitao Xie, Zhengping Yi, Benjamin Bowen, Cassandra Wolf, Charles R. Flynn, Sandeep Sinha, Lawrence J. Mandarino, and Christian Meyer, “Characterization of the Human Adipocyte Proteome and Reproducibility of Protein Abundance by One-dimensional Gel Electrophoresis and HPLC-ESI-MS/MS”, Journal of Proteome Research, 2010 Sep 3;9(9):4521-34. PMID: 20812759. 32. Paul Langlais, Lawrence J. Mandarino, and Zhengping Yi, “Label-free Relative Quantification of Co-eluting Isobaric Phosphopeptides of Insulin Receptor Substrate-1 by HPLC-ESI-MS/MS”, Journal of the American Society for Mass Spectrometry, 2010 Sep;21(9):1490-9. Epub 2010 Jun 9. PMID: 20594869. 33. Kurt Hojlund, Zhengping Yi, Natalie Lefort, Paul Langlais, Benjamin P. Bowen, Klaus Levin, Henning Beck-Nielsen, and Lawrence J. Mandarino, “Human ATP synthase beta is phosphorylated at multiple sites and shows abnormal phosphorylation at specific sites in insulin-resistant muscle”, Diabetologia, 2010 Mar;53(3):541-51. PMID: 20012595. 34. Hyonson Hwang, Benjamin P. Bowen, Natalie Lefort, Charles R. Flynn, Elena A. De Filippis, Christine Roberts, Chris Smoke, Christian Meyer, Kurt Hojlund, Zhengping Yi, and Lawrence J. Mandarino, “Proteomics Analysis of Human Skeletal Muscle Reveals Novel Abnormalities in Obesity and Type 2 Diabetes Mellitus”, Diabetes, 2010 Jan;59(1):33-42. PMID: 19833877. 35. Kurt Hojlund, Benjamin P. Bowen, Hyonson Hwang, Charles R. Flynn, Lohith Madireddy, Thangiah Geetha, Paul Langlais, Christian Meyer, Lawrence J. Mandarino, and Zhengping Yi, “In vivo phosphoproteome of human skeletal muscle revealed by phosphopeptide enrichment and HPLC-ESI-MS/MS”, Journal of Proteome Research, 2009 Nov;8(11):4954-65. PMID: 19764811. 36. Natalie Lefort, Zhengping Yi, Benjamin P. Bowen, Brian Glancy, Elena A. De Filippis, Rebekka Mapes, Hyonson Hwang, Charles R. Flynn, Wayne T. Willis, Anthony Civitarese, Kurt Hojlund, and Lawrence J. Mandarino, “Proteome profile of functional mitochondria from human skeletal muscle using one-dimensional gel electrophoresis and HPLC-ESI-MS/MS”, Journal of Proteomics, 2009 Aug 20;72(6):1046-60. Epub 2009 Jun 28. PMID: 19567276. 37. Zhengping Yi, Benjamin P. Bowen, Hyonson Hwang, Christopher P. Jenkinson, Dawn K. Coletta, Natalie Lefort, Mandeep Bajaj, Sangeeta Kashyap, Rachele Berria, Elena A. De Filippis, and Lawrence J. Mandarino, "Global Relationship between the Proteome and Transcriptome of Human Skeletal Muscle", Journal of Proteome Research, 2008 Aug; 7(8):3230-41. Epub 2008 Jul 10. PMID: 18613714. 38. Kurt Højlund, Zhengping Yi, Hyonson Hwang, Benjamin P. Bowen, Natalie Lefort, Charles R. Flynn, Paul Langlais, Susan T. Weintraub, and Lawrence J. Mandarino, "Characterization of the Human Skeletal Muscle Proteome by One-dimensional Gel Electrophoresis and HPLC-ESI-MS/MS", Molecular & Cellular Proteomics, 2008 Feb;7(2):257-67. Epub 2007 Oct 1. PMID: 17911086. 39. Zhengping Yi, Paul Langlais, Elena A. De Filippis, Moulun Luo, Charles R. Flynn, Stefanie Schroeder, Susan T. Weintraub, Rebekka Mapes, and Lawrence J. Mandarino, “Global assessment of regulation of phosphorylation of insulin receptor substrate-1 by insulin in vivo in human muscle”, Diabetes. 2007 Jun; 56(6):1508-16. Epub 2007 Mar 14. PMID: 17360977. 40. Moulun Luo, Paul Langlais, Zhengping Yi, Natalie Lefort, Elena A. De Filippis, Hyonson Hwang, Christine Y. Christ-Roberts, and Lawrence J. Mandarino, “Phosphorylation of Human IRS-1 at Ser629 Plays a Positive Role in Insulin Signaling”, Endocrinology. 2007 Oct; 148(10):4895-905. Epub 2007 Jul 19. PMID: 17640984. 41. Tiana C. White, Zhengping Yi and Brenda G. Hogue, “Identification of Mouse Hepatitis Coronavirus A59 Nucleocapsid Protein Phosphorylation Sites”, Virus Research, 2007 Jun; 126(1-2):139-48. 42. Charles R. Flynn, Christopher C. Smoke, Elizabeth Furnish, Padmini Komalavilas, Jeffrey Thresher, Zhengping Yi, Lawrence J. Mandarino, Colleen M. Brophy, “Phosphorylation and activation of a transducible recombinant form of human HSP20 in E. coli”, Protein Expression and Purification, 2007, 52, 50–58. Epub 2006 Sep 12. PMID: 17084643. 43. Zhengping Yi, Moulun Luo, Sara M. Reyna, Christopher A. Carroll, Susan T. Weintraub, and Lawrence J. Mandarino, “Quantification of Phosphorylation of Insulin Receptor Substrate-1 by HPLC-ESI/MS/MS”, Journal of the American Society for Mass Spectrometry, 2006, 17(4), 562-7. Epub 2006 Feb 28. PMID: 16503154. 44. Zhengping Yi, Olga Vitek, M. A. Qasim, Stephen M. Lu, Wuyuan Lu, Michael Ranjbar, Jiangtian Li, Michael C. Laskowski, Chris Bailey-Kellogg, and Michael Laskowski, Jr., “Functional Evolution within a Protein Superfamily”, Proteins-Structure, Function, and Bioinformatics, 2006, 63(3),697-708. 45. Zhengping Yi, M. A. Qasim, Sabiha Qasim, Terrell L. Warrington, and M. Laskowski, Jr. “Ring-Toss. Capping hyperexposed tyrosyl or tryptophyl residues in proteins by beta-cyclodextrin”, Biochimica and Biophysica Acta-General Subjects, 2006, 1760, 372-379. 46. Zhengping Yi, Moulun Luo, Christopher Carroll, Susan T. Weintraub, and Lawrence J. Mandarino, “Identification of Phosphorylation Motifs in Insulin Receptor Substrate (IRS)-1 by Hypothesis-Driven HPLC-ESI/MS/MS”, Analytical Chemistry, 2005, 77, 5693-5699. PMID: 16131083. 47. Moulun Luo, Sara Reyna, Lishan Wang, ZhengPing Yi, Christopher Carroll, Lily Q. Dong, Paul Langlais, Susan T. Weintraub, and Lawrence J. Mandarino, “Identification of IRS-1 Serine/Threonine Phosphorylation Sites Using Mass Spectrometry Analysis; Regulatory Role of Serine 1223”, Endocrinology, 2005, 146, 4410-4416. Epub 2005 Jul 14. PMID: 16020478. 49. Michael Laskowski, Jr., M. A. Qasim and ZhengPing Yi, "Additivity-based prediction of equilibrium constants for some protein–protein associations", Current Opinion in Structural Biology, 2003, Vol. 13 (1), 130-139. 50. M.A. Qasim, Wuyuan Lu, Stephen M. Lu, Michael Ranjbar, ZhengPing Yi, YiWen Chiang, Kevin Ryan, Stephen Anderson, Wenlei Zhang, Sabiha Qasim, and Michael Laskowski, Jr., “Testing of the Additivity Based Protein Sequence to Reactivity Algorithm”, Biochemistry, 2003, Vol. 42, 6460-6466. 51. Zheng-Ping Yi, Ju Hu, and Hui-Lan Chen, "The comparison of the orientation of sodium 3-hydroxy-2-naphtalenecarboxy-late anion in the cavity of beta-cyclodextrin and heptakis- (2, 3, 6-tri-o-methyl)-beta-cyclodextrin", Journal of Inclusion Phenomena and Macrocyclic Chemistry, 2003, Vol. 45, 1-7. 52. Zheng-Ping Yi, Hui-Lan Chen, Zhengzi Huang, Qing Huang, and Jun-Sheng Yu, “Contributions of weak interactions to the Inclusion Complexation of 3-Hydroxy -2-Naphthalenecarboxylic Acid and It’s Analogues with Cyclodextrins”, Journal of The Chemical Society-Perkin Transactions 2, 2000, 121. 53. Zheng-Ping Yi, Ju Hu, Qing Huang, and Hui-Lan Chen, “Conformational Analysis of the Inclusion Complex of 3-Hydroxy-2-Naphthalenecarboxylate Anion with Heptakis- (2, 3, 6-tri-o-methyl)-beta-Cyclodextrin in D2O by 2D 1HNMR”, Spectroscopy Letters, 2000, Vol. 33, 407. 54. Zheng-Ping Yi, Jian-Ping Zou, Yang, Hui-Lan Chen, and Xi-Mao Bao, “The investigation of Si-based Nanoporous Alumina Film-Sodium 3-Hydroxy-2- Naphthalenecarboxylate Fluorescent Compound Material”, Chinese Journal of Semiconductors, 2000, Vol. 21(8), 770. 55. Zhengping Yi, Changchun Zhao, Zhengzi Huang, Huilan Chen, and Junsheng Yu, "Investigation of Buffer-Cyclodextrin System", Physical Chemistry Chemical Physics, 1999, Vol. 1, 441. 56. Zhengping Yi, Zhengzi Huang, Junsheng Yu, and Huilan Chen, “Be Careful When You Want to Use Buffers in Aqueous Solutions of Cyclodextrins. Effect of Buffers on the Formation Constants of 3-Hydroxy-2-Naphthoic Acid with Beta- Cyclodextrin”, Chemistry Letters, 1998, 1161. 57. Zhengping Yi, Changchun Zhao, Huilan Chen, and Junsheng Yu, “Effect of pH values on the formation constants of 3-Hydroxy-2-Naphthoic Acid with Beta-Cyclodextrin”, Chinese Journal of Inorganic Chemistry, 1997, Vol.13, 164. 58. Zhi-Lin Wang, Zheng-Ping Yi, Tian Li, Ying Chen, Zhi-Ming Huang, Gui-Di Yang, De-Ping Xue and Hui-Lan. Chen, “Studies on coenzyme B-12 model complexes.8. The characterization of products of photochemical reactions of oxygen insertion into Co-C bond of RCo (Salen) L complexes,” Chemical Journal of Chinese Universities-Chinese, 1996, Vol.17, 21. 1. Zhengping Yi and Xiangmin Zhang, “Cell line with inducible protein phosphatase 1 regulatory subunit 12A (PPP1R12A) knockdown, Lentiviruses and Adenovirus for overexpressing or knockdown PPP1R12A”, 2014. 2. Zhengping Yi and Xiangmin Zhang, "Isolating adherent cell clones by tracing circular petroleum jelly walls", 2017. 3. Yue Qi (GRA), Lingzhi Li, Michael Caruso (Postdoc), Xiangmin Zhang, Fei Chen, Zhengping Yi, "Quantitative Phosphoproteomics Unveils Novel Phosphorylation Events in Transformed Human Bronchial Epithelial Cell Induced by Arsenic", the 65th American Society for Mass Spectrometry (ASMS) Conference, June 4-8, 2017, Indianapolis, Indiana. 4. Divyasri Damacharla (GRA), Xiangmin Zhang, Danjun Ma (Postdoc), Monique Lewis (Postdoc), Michael A. Caruso (Postdoc), Wissam Al-janabi; Yue Qi (GRA), Zhao Yang (GRA), Rodney Berry; Abdullah Mallisho (Postdoc), Zaher Msallaty (Postdoc), Rebecca Tagett (GRA), Sorin Draghici, Jeffrey Horowitz2 Berhane Seyoum, and Zhengping Yi, "Identification of interaction partners of Protein Phosphatase 2A in human skeletal muscle using Label free Mass spectrometry", the 65th American Society for Mass Spectrometry (ASMS) Conference, June 4-8, 2017, Indianapolis, Indiana. 6. Abdullah Mallisho (Postdoc), Michael Caruso (Postdoc), Nishit Shah (GRA), Berhane Seyoum, Yue Qi (GRA), Divyasri Damacharla (GRA), Danjun Ma (Postdoc), Xiangmin Zhang, Zhengping Yi, "Effect of metformin on phosphorylation profile of insulin resistant primary human skeletal muscle cells". The American Diabetes Association’s 76th Scientific Sessions, June 10-14, 2016 in New Orleans, Louisiana. 7. Yue Qi (GRA), Abdullah Mallisho (Postdoc), Divyasri Damacharla (GRA), Nishit Shah (GRA), Majed Alharbi, Alice Hu, Michael Alexander Caruso, Danjun Ma (Postdoc), Xiangmin Zhang, Zaher Msallaty (Postdoc), Berhane Seyoum, Zhengping Yi, "Quantitative Proteomics Analysis Reveals Abnormalities of Global Kinome Interactome in Obese Insulin Resistant Human Participants". The American Diabetes Association’s 76th Scientific Sessions, June 10-14, 2016 in New Orleans, Louisiana. 8. Yue Qi (GRA), Majed Alharbi, Abdullah Mallisho (Postdoc), Michael Caruso (Postdoc), Nishit Shah (GRA), Divyasri Damacharla (GRA), Alice Hu, Danjun Ma (Postdoc), Xiangmin Zhang, Berhane Seyoum, Zhengping Yi, "Differential Protein Ubiquitination Profiles in Primary Human Skeletal Muscle Cells under Hyperinsulinemic Hyperglycemic Conditions Revealed by HPLC-ESI-MS/MS". The 64th American Society for Mass Spectrometry (ASMS) Conference, June 6-9, 2016 in San Antonio, TX. 9. Danjun Ma (Postdoc), Lisa Guth, Yue Qi (GRA), Michael Caruso (Postdoc), Xiangmin Zhang, Jeffrey Horowitz, Zhengping Yi, "Effect of Exercise on skeletal muscle phosphoproteome in obese insulin resistant adults". The 64th American Society for Mass Spectrometry (ASMS) Conference, June 6-9, 2016 in San Antonio, TX. 10. Yue Qi (GRA), Abdullah Mallisho (Postdoc), Danjun Ma (Postdoc), Xiangmin Zhang, Michael Caruso (Postdoc), Divyasri Damacharla (GRA), Rodney Berry, Nishit Shah (GRA), Majed Abdullah. Alharbi, Majed Abdullah. Alharbi, Berhane Seyoum, Zhengping Yi, “Global Kinome Interactome in Human Skeletal Muscle Revealed by ATP Affinity Probes and Proteomics”. The 75th American Diabetes Association conference, June 5 - 9, 2015, Boston, Massachusetts. 11. Danjun Ma (Postdoc), Yue Qi (GRA), Abdullah Mallisho (Postdoc), Michael Alexander. Caruso, Divyasri Damacharla (GRA), Xiangmin Zhang, Rebecca Tagett (GRA), Sorin Draghici, Rodney O. Berry, Nishit Shah (GRA), Majed Abdullah. Alharbi, Berhane Seyoum, Zhengping Yi, “Abnormal Protein Phosphorylation In Plasma From Type 2 Diabetic Patients”. The 75th American Diabetes Association conference, June 5 - 9, 2015, Boston, Massachusetts. 12. Danjun Ma (Postdoc), Xiangmin Zhang, Yue Qi (GRA), Abdullah Mallisho (Postdoc), Rodney Berry, Michael Caruso (Postdoc), Divyasri Damacharla (GRA), Jeffrey Horowitz, Berhane Seyoum, Zhengping Yi, “Insulin-stimulated Tyrosine Phosphorylation Of Phospholipase C Is Impaired In Type 2 Diabetic Skeletal Muscle”. The 75th American Diabetes Association conference, June 5 - 9, 2015, Boston, Massachusetts. 13. Yue Qi (GRA); Abdullah Mallisho (Postdoc); Danjun Ma (Postdoc); Xiangmin Zhang; Michael Caruso (Postdoc); Divyasri Damacharla (GRA); Nishit Shah (GRA); Majed Abdullah Alharbi; Berhane Seyoum; Zhengping Yi, "Comparison of ATP Affinity Probe-based kinome enrichment at the protein and peptide levels". The 63rd ASMS Conference on Mass Spectrometry and Allied Topics, May 31 - June 4, 2015 - America's Center, St. Louis, Missouri. 14. Danjun Ma (Postdoc); Alemu Fite; Xiangmin Zhang; Yue Qi (GRA); Michael Howard Wood; Rebecca Tagett (GRA); Sorin Draghici; Berhane Seyoum; Zhengping Yi, "Global protein profiling of visceral fat and subcutaneous fat from obese non-diabetic and obese T2D subjects". The 63rd ASMS Conference on Mass Spectrometry and Allied Topics, May 31 - June 4, 2015 - America's Center, St. Louis, Missouri. 15. Divyasri Damacharla (GRA); Xiangmin Zhang; Danjun Ma (Postdoc); Yue Qi (GRA); Anjaneyulu Kowluru; Zhengping Yi, "Protein Interaction Partners of Protein Phosphatase 2A Catalytic Subunit in Rat β-Islet cells Using Quantitative Mass Spectrometry". The 63rd ASMS Conference on Mass Spectrometry and Allied Topics, May 31 - June 4, 2015 - America's Center, St. Louis, Missouri. 16. Michael Caruso (Postdoc), Danjun Ma (Postdoc), Berhane Seyoum, Monique K. Lewis (Postdoc), Xiangmin Zhang, Zaher Msallaty (Postdoc), Wissam Al-janabi, Zhao Yang (GRA), Divyasri Damacharla (GRA), Yue Qi (GRA), Michael Diamond, Abdul B. Abou-Samra, Rebecca Tagett (GRA), Sorin Draghici, Jeffrey F. Horowitz, and Zhengping Yi, “Human Skeletal Muscle PPP1R12A Interactome in Insulin Resistance and Type 2 Diabetes”, the 16th International Congress of Endocrinology & The Endocrine Society’s 96th Annual Meeting & Expo (ICE/ENDO), June 21-24, 2014, Chicago, Illinois. 17. Xiangmin Zhang, Divyasri Damacharla (GRA), Michael Caruso (Postdoc), Monique K. Lewis (Postdoc), Danjun Ma (Postdoc), Zhao Yang (GRA), Yue Qi (GRA), Rodney Berry, Berhane Seyoum, Zaher Msallaty (Postdoc), Wissam Al-janabi1, Rebecca Tagett (GRA), Sorin Draghici, Jeffrey F. Horowitz, and Zhengping Yi, “Dysfunctional Protein Phosphatase 2A in Human Skeletal Muscle in Type 2 Diabetes”, the American Diabetes Association 74th Scientific Sessions, June 13-17, 2014, Moscone Center in San Francisco, CA. 18. Danjun Ma (Postdoc), Sean A. Newsom, Xiangmin Zhang, Yue Qi (GRA), Jeffrey F. Horowitz, and Zhengping Yi, “Exercise regulation on skeletal muscle phosphoproteome in obese insulin resistant adults”, the American Diabetes Association 74th Scientific Sessions, June 13-17, 2014, Moscone Center in San Francisco, CA. 19. Xitao Xie, Zhengping Yi, Sandeep Sinha, Ben Bowen, Paul Langlais, Lawrence J. Mandarino Christian Meyer, "Proteomics Analysis of Subcutaneous Adipocytes Reveals Novel Abnormalities in Human Insulin Resistance", the American Diabetes Association 74th Scientific Sessions, June 13-17, 2014, Moscone Center in San Francisco, CA. 20. Divyasri Damacharla (GRA); Xiangmin Zhang; Danjun Ma (Postdoc); Monique K. Lewis (Postdoc); Michael Caruso (Postdoc); Wissam Al-janabi; Yue Qi (GRA); Zhao Yang (GRA); Rodney Berry; Abdullah Mallisho (Postdoc); Zaher Msallaty (Postdoc); Sorin Draghici; Jeffrey Horowitz; Berhane Seyoum; Zhengping Yi, “Identification of Protein Interaction Partners of Protein Phosphatase 2A Catalytic Subunit Using Quantitative Mass Spectrometry”, the 62nd American Society for Mass Spectrometry Conference on Mass Spectrometry, June 15-19, 2014, Baltimore Convention Center, Baltimore, MD. 21. Danjun Ma (Postdoc); Berhane Seyoum; Michael Caruso (Postdoc); Zaher Msallaty (Postdoc); Monique K. Lewis (Postdoc); Chengjian Tu; Michael Diamond; Abdul Abou-Samra; Xiangmin Zhang; Wissam Al-janabi; Rodney Berry; Kurt Højlund; Jeffrey Horowitz; Rebecca Tagett (GRA); Sorin Draghici; Zhengping Yi, “Impaired Regulation of Tyrosine Phosphorylation in Skeletal Muscle in Type 2 Diabetes”, the 62nd American Society for Mass Spectrometry Conference on Mass Spectrometry, June 15-19, 2014, Baltimore Convention Center, Baltimore, MD. 22. Yue Qi (GRA); Danjun Ma (Postdoc); Michael Caruso (Postdoc); Monique K. Lewis (Postdoc); Xiangmin Zhang; Wissam Al-Janabi; Divyasri Damacharla (GRA); Zhao Yang (GRA); Rodney Berry; Abdullah Mallisho (Postdoc); Zaher Msallaty (Postdoc); Sorin Draghici; Assia Shisheva; Berhane Seyoum; Zhengping Yi, “Large Scale Kinome Analysis of Human Skeletal Muscle using ATP Probes and HPLC-ESI-MS/MS”, the 62nd American Society for Mass Spectrometry Conference on Mass Spectrometry, June 15-19, 2014, Baltimore Convention Center, Baltimore, MD. 23. Zhao Yang (GRA); Michael Caruso (Postdoc); Danjun Ma (Postdoc); Abdullah Mallisho (Postdoc); Berhane Seyoum; Monique K. Lewis (Postdoc); Xiangmin Zhang; Wissam Al-Janabi; Yue Qi (GRA); Divyasri Damacharla (GRA); Rodney Berry; Zaher Msallaty (Postdoc); Sorin Draghici; Assia Shisheva; Zhengping Yi, “Protein Phosphatase 1 Catalytic Subunit Protein Interaction Partners in Human Skeletal Muscle Revealed by Targeted Proteomics”, the 62nd American Society for Mass Spectrometry Conference on Mass Spectrometry, June 15-19, 2014, Baltimore Convention Center, Baltimore, MD. 24. Michael Caruso (Postdoc), Xiangmin Zhang, Danjun Ma (Postdoc), Monique K. Lewis (Postdoc), Wissam Anteer, Zaher Msallaty (Postdoc), Berhane Seyoum, Jeffrey F. Horowitz, Michael P. Diamond, Zhengping Yi, "Proteomic Analysis of Insulin-Stimulated Insulin Receptor Substrate-1 Protein Interaction Partners in Human Skeletal Muscle and Type 2 Diabetes", the American Diabetes Association 73rd Scientific Sessions, June 21-25, 2013, in Chicago, IL. 25. Zaher Msallaty (Postdoc), Xiangmin Zhang, Michael Caruso (Postdoc), Danjun Ma (Postdoc), Monique K. Lewis (Postdoc), Wissam Anteer, Rodney Berry, Nour Daboul, Michael P. Diamond, Abdul Abou-Samra, Gregory D. Cartee, Jeffrey F. Horowitz, Berhane Seyoum, and Zhengping Yi, “AS160 Phosphorylation in Human Skeletal Muscle Biopsies Obtained During Hyperinsulinemic Euglycemic Clamp Studies”, the American Diabetes Association 73rd Scientific Sessions, June 21-25, 2013, in Chicago, IL. 26. Danjun Ma (Postdoc), Michael Caruso (Postdoc), Monique K. Lewis (Postdoc), Xiangmin Zhang, Wissam Anteer, Rodney Berry, Nour Daboul, Zaher Msallaty (Postdoc), Michael P. Diamond, Abdul Abou-Samra, Berhane Seyoum, Jeffrey Horowitz, and Zhengping Yi, “Differential Phosphoproteome in human skeletal muscle in obesity and type 2 diabetes”, the American Diabetes Association 73rd Scientific Sessions, June 21-25, 2013, in Chicago, IL. 27. Xiangmin Zhang, Danjun Ma (Postdoc), Michael Caruso (Postdoc), Monique K. Lewis (Postdoc), Ognian Ikonomov, Assia Shisheva, and Zhengping Yi, "Knockdown of Protein Phosphatase 1 Regulatory Subunit Negatively Affects Insulin Action", the American Diabetes Association 73rd Scientific Sessions, June 21-25, 2013, in Chicago, IL. 28. Michael Caruso (Postdoc), Danjun Ma (Postdoc), Xiangmin Zhang, Rebecca Tagett (GRA), Sorin Draghici, and Zhengping Yi, "HPLC-ESI-MS/MS Analysis of Insulin-Stimulated Akt2 Protein Interaction Partners in L6 Myotubes", the American Diabetes Association 73rd Scientific Sessions, June 21-25, 2013, in Chicago, IL. 29. Monique K. Lewis (Postdoc), Danjun Ma (Postdoc), Michael Caruso (Postdoc), Monique K. Lewis (Postdoc), Xiangmin Zhang, Zaher Msallaty (Postdoc), Berhane Seyoum, Jeffrey Horowitz, and Zhengping Yi, “Reduced Abundance of Protein Phosphatase 1 Regulatory Subunit 12B in Diabetes Revealed by Targeted Proteomics”, the 61st American Society for Mass Spectrometry Conference on Mass Spectrometry, June 9-13, 2013, Minneapolis, Minnesota. 30. Danjun Ma (Postdoc), Michael Caruso (Postdoc), Monique K. Lewis (Postdoc), Xiangmin Zhang, Zaher Msallaty (Postdoc), Berhane Seyoum, Jeffrey Horowitz, and Zhengping Yi, “Tyrosine Phosphoproteomics analysis of human skeletal muscle”, the 61st American Society for Mass Spectrometry Conference on Mass Spectrometry, June 9-13, 2013, Minneapolis, Minnesota. 31. Xiangmin Zhang, Michael Caruso (Postdoc), Danjun Ma (Postdoc), and Zhengping Yi, “Identification of PPP1R12A interaction partners in L6 myotubes by Co-IP and HPLC-MS/MS”, the 72nd American Diabetes Association Scientific Sessions, June 8-12, 2012 in Philadelphia, Pennsylvania. 32. Danjun Ma (Postdoc), Xiangmin Zhang, Michael Caruso (Postdoc), and Zhengping Yi, “Label-free Quantitative Phosphoproteomics Analysis of Insulin-Stimulated Phosphorylation in L6 Myotubes”, the 60th American Society for Mass Spectrometry Conference on Mass Spectrometry, May 20th – 24th, 2012, Vancouver, BC, Canada. 33. Jian-Ying Zhou; Marina A. Gritsenko; Therese R.W. Clauss; Xiangmin Zhang; Morgan Zingsheim; Danjun Ma (Postdoc); Michael Caruso (Postdoc); Richard D. Smith; Wei-Jun Qian; and Zhengping Yi, “Regulation of Insulin on Global Phosphorylation of Human Skeletal Muscle Revealed by Phosphoproteomics”, the 60th American Society for Mass Spectrometry Conference on Mass Spectrometry, May 20th – 24th, 2012, Vancouver, BC, Canada. 34. Xiangmin Zhang, Paul Langlais, Alex Chao, Kimberly Pham, James Dillon, Moulun Luo, Lawrence J. Mandarino, and Zhengping Yi, "Regulation of Phosphorylation of Protein Phosphatase 1 Regulatory Subunit 12A", the 71th American Diabetes Association Scientific Sessions, June 24 - 28, 2011. 35. Yifei Wu (Postdoc), Xiangmin Zhang, Paul Langlais, Morgan Zingsheim, Alex Chao, Lawrence J. Mandarino, Kurt Hojlund, and Zhengping Yi, “Glycogen synthase is phosphorylated at tyrosine 212 and this novel site is insulin stimulated in 3T3-L1 cells”, the 71th American Diabetes Association Scientific Sessions, June 24 - 28, 2011. 36. Kimberly Pham, Paul Langlais, Alex Chao, Morgan Zingsheim, Xiangmin Zhang, and Zhengping Yi, “HPLC-ESI-MS/MS Analysis of Protein Phosphatase 1 Regulatory Subunit 12B Phosphorylation”, the 59th American Society for Mass Spectrometry Conference, June 5 - 9, 2011. 37. Thangiah Geetha, Paul Langlais, Moulun Lou, Morgan Zingsheim, Lawrence J. Mandarino, and Zhengping Yi, “Protein phosphatase 1 regulatory subunit 12A (PPP1R12A), a new family member in the IRS-1 signaling complex”, the 70th American Diabetes Association Scientific Sessions, June 25 - 29, 2010. 38. Thangiah Geetha, Kurt Hojlund, Morgan Zingsheim, Christine Christ-Roberts, Rebekka Mapes, Moulun Lou, Mark Mattern, Christian Meyer, Lawrence J. Mandarino, and Zhengping Yi, “Novel Tyrosine Phosphorylation Sites in Skeletal Muscle Identified by HPLC-ESI-MS/MS”, the 70th American Diabetes Association Scientific Sessions, June 25 - 29, 2010. 39. Paul Langlais, Lawrence J. Mandarino, and Zhengping Yi, “Label-free Relative Quantification of Co-eluting Isobaric Phosphopeptides of Insulin Receptor Substrate-1 by HPLC-ESI-MS/MS”, The 58th American Society for Mass Spectrometry Conference, May 23 - 27, 2010. 40. Zhengping Yi, Moulun Lou, Rebekka Mapes, Natalie Lefort, Paul Langlais, Benjamin Bowen, and Lawrence J. Mandarino, “Identification of Novel IRS-1 Binding Partners by HPLC-ESI-MS/MS”, the 69th American Diabetes Association Annual Scientific Sessions, Jun.5 -Jun. 9, 2009. 41. Zhengping Yi, Benjamin Bowen, Hyonson Hwang, Natalie Lefort, Kurt Højlund, Charles R. Flynn, Elena De Filippis, Christian Meyer, and Lawrence J. Mandarino, “Investigation of Phosphoproteome of Human Skeletal Muscle by Global and Targeted HPLC-ESI-MS/MS”, The 56th American Society for Mass Spectrometry Conference, Jun.1-Jun.6, 2008. 42. Zhengping Yi, Benjamin Bowen, Hyonson Hwang, Charles R. Flynn, Elena De Filippis, Christian Meyer, and Lawrence J. Mandarino, “Phosphoproteome of Human Skeletal Muscle revealed by HPLC-ESI-MS/MS”, The 68th American Diabetes Association Annual Scientific Sessions, Jun.6 -Jun. 10, 2008. 43. Zhengping Yi, Hyonson Hwang, Benjamin P. Bowen, Natalie Lefort, Charles R. Flynn, Paul Langlais, Susan T. Weintraub, Lawrence J. Mandarino, and Kurt Højlund, “Comprehensive characterization of the human skeletal muscle proteome by LC-MS/MS”, The 67th American Diabetes Association Annual Scientific Sessions, Jun.22 -Jun. 26, 2007. 44. Zhengping Yi, Paul Langlais, Moulun Luo, Sara M. Reyna, Christopher A. Carroll, Susan T. Weintraub, and Lawrence J. Mandarino, “Quantification of Serine/Threonine Phosphorylation of Insulin Receptor Substrate (IRS)-1 by HPLC-ESI/MS/MS”, the 66th American Diabetes Association Annual Scientific Sessions, Jun.9 -Jun. 13, 2006. 45. Zhengping Yi, Paul Langlais, Moulun Luo, Sara M. Reyna, Christopher A. Carroll, Susan T. Weintraub, and Lawrence J. Mandarino, “Quantification of Phosphopeptideome of Insulin Receptor Substrate (IRS)-1 by Hypothesis-Driven Multi-segment HPLC-ESI/MS/MS”, The 54th American Society for Mass Spectrometry Conference, May 28-Jun. 1, 2006. 46. Zhengping Yi, Moulun Luo, Christopher Carroll, Susan T. Weintraub, and Lawrence J. Mandarino, “Identification of Phosphorylation Motifs in Insulin Receptor Substrate (IRS)-1 by Hypothesis-Driven HPLC-ESI/MS/MS”. The 53rd American Society for Mass Spectrometry Conference, Jun. 5-Jun. 9, 2005. 47. ZhengPing Yi, S. Lu, O. Vitek, C. Bailey-Kellogg and M. Laskowski, Jr., "Sequence to Reactivity Algorithm Helps with Understanding the Evolution of Protein Families". The 17th Symposium of the Protein Society, Jul. 25-Jul. 30, 2003. 48. Zheng-Ping Yi, Terrell L. Warrington, M. A. Qasim, Sabiha Qasim, and M. Laskowski, Jr., “Ring-Toss. Spectrophotometric criterion for hyperexposed tyrosyl or tryptophyl residues in proteins.” The 15th Symposium of the Protein Society, Jul.27- Aug. 1, 2001.